It will be rare that you hear me defend a Trump. However, here goes. Melania's heels were beautiful. 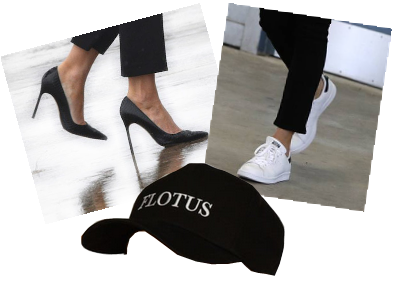 As she was leaving the White House to visit flooded Houston, she wore her signature heels. I applaud her gracefulness walking in these and her ability to navigate grass; a nearly impossible task. Try it someday and you will see. Upon arriving she change to more appropriate sneakers although white may not have been the best choice for a flood zone. Still, she looked beautiful and tasteful even in her "FLOTUS" hat. (Where can I get one of those?) She was a runway model – No one should be shocked or surprised if she always dresses the part. The whole world has become her runway. Saturday Update - No to be deterred!